Notice the knife stuck into the rotten part of the support beam? That beam has got to come out. There it is, all fresh and new. See the rot on the old beam in the foreground? It's good that's not supporting a house anymore. Dry rot had claimed these stairs. We re-designed the stairs so each step was of equal height. That's why there's more steps in the after picture. Oh, and Consider It Done Construction painted the house, too. 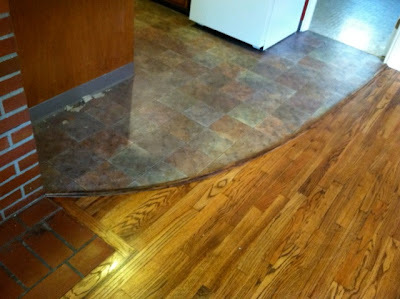 You have to look closely to see the work area: This nice new flooring needed a transition strip, and the available pre-made choices were either ugly metal or a vinyl that didn't match. Consider It Done Construction made a piece of wood do the job. We milled the wood to follow the curved transition line exactly. We stained it to match the wood flooring, and now you almost don't see it at all. Which is an ideal application for a transition strip!